Figured yesterday would relinquish little fodder to pen but boy was I mistaken. As the seventh group of the day was finishing on the par five eighteenth, players A and B laid up while C waited to go for it. The two were given the OK to walk up ahead during the wait but a change of mind precipitated the third player to also lay up. To save time, since all three were in no position to make the cut, A and B hit into the green. Everything seemed fine until handshakes were in order. C’s caddie refused, walked up to one of the other loopers and punched him in the chest! This was in response to a lack of respect for his player he said. Security was called and the local police took statements. No charges were pressed so the pugilistic bag-toter (who claimed self-defense) was not arrested. Who was this looper with a readiness to rumble you ask? For those in the know, player C’s caddie was once a regular on the LPGA and known as Sir Whiff-a-Lot for his propensity to oversleep and whiff his tee time. He was fresh off the web.com tour and lets hope that’s where he returns. BTW, he’s added about thirty pounds of muscle, to what was an ordinary frame, so Roid Rage is a possibility. Still amazes me the attitude of some players and caddies when entering the player dining area. Players are obligated to show their ID and caddies must wear (not just display) a wrist band dedicated for that specific day. One player’s brother dropped a few f-bombs yesterday asked to attach the band to his wrist and not just show it. The idea is that it can’t be passed around. He dropped a few more bombs then walked away instead of complying. Too bad one of the officials wasn’t present. As far as some players go, they refuse to show ID and walk right pass security. Another caddie party was scheduled today along the 12th hole. The same family has offered food and drink the last few years. I walked the back nine starting on the eighteenth. Play seemed extremely slow. Watched one group on the par four fifteenth. A tee ball went into the water and a shot to the green went over into the water (not the same player). The player had to go back to the fairway for her fourth shot. Even with all that, it took fifteen minutes for the next group to arrive and there still was a gap between the group behind. 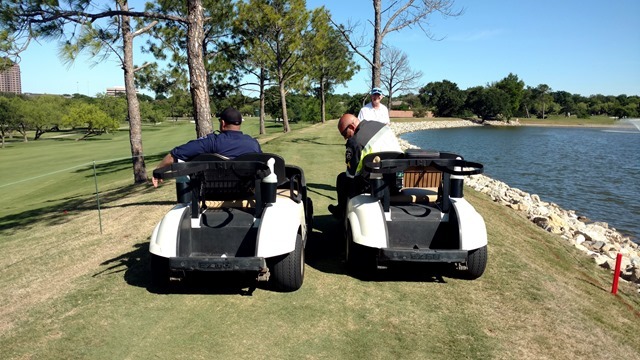 When I approached the landing area on the par five tenth, two officers had their golf carts parked next to each other just outside the hazard that boarders the right side. When I was just a few feet away, a ball landed between them (about a foot of space), just misses me and stays dry a few feet from the hazard. It was the tee shot of Sandra Gal. Unfortunately, her recovery shot hit the trees blocking the fairway. Made bogey. Caddies aren’t the only ones who leave there car running. One of the players did it earlier this week. Fortunately, they knew who it was and saved her the embarrassment of an empty tank. I’ve run across a few LG TVs the past few years and hate them with a passion. They have a light sensing technology that dims the screen according to the ambient light and can’t be turned off in the settings. Makes the screen so dark it’s unwatchable. My work-around is a small flashlight aimed at the sensor. That keeps the screen at an optimum brightness. Cool and very windy. Thunder delayed the start of the pro-am for ninety minutes. Tournament Director Kate Scarpetta was here hawking the $100,000 Pennsylvania Women’s Open and offered up an interesting story. The lady who won it twenty-two years ago will be playing and her son will be carrying the bag. She was five months pregnant with him when she won. “ I carried him the last time.” she said. -3 qualified on Monday. Scores here. Worked nine holes for Dana Finkelstein Sunday afternoon. It was an absolute joy. 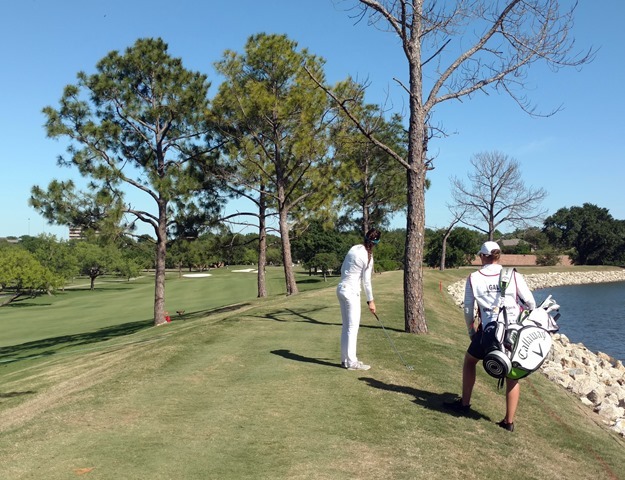 The scores in the Symetra event last week were outrageously high. What happened? Food in the caddie area is first rate. The same as they serve in player dining. One of the caddies got stopped for going eight miles per hour over the speed limit by the local gendarmes with guns drawn. Apparently he didn’t pull over soon enough after they lit him up. All is well though. They apologized and set him on his way. Welcome to Texas! PGA pro Joel Edwards is looping for Annie Park and David Esch (Annika’s former husband) is on Julie Yang’s bag. Left Tucson Friday and made it to Midland TX. 75-80 mph most of the way with a tailwind. Used up my Choice reward points at the Suburban Extended Stay. Outstanding! 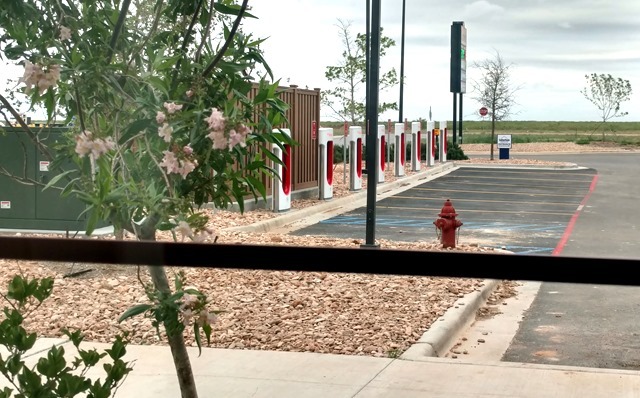 There were eight Tesla charging stations just outside my window. All empty. Must be difficult to plan a trip based on electrical outlets. The Love’s Travel Stop next door has a Subway. Haven’t eaten at one in many moons so I gave it a go. Had the foot long meatball with black olives. Actually pretty good but I paid for it in the morning. Second leg of my trip was 334 miles of fighting a NNE crosswind. Monday qualifier caddies are needed. I passed. Staying at a Studio 6. Not near as nice as Phoenix and too many permanent residents, if you know what I mean. It does have a good shower though. In fact, too good. Most motels have opted for weak, water saving devices but not here. There is so much pressure and the water stream is so fine, it actually stings if you stand in one place too long. You are currently browsing the Life on Tour blog archives for April, 2017.